This is odd. But true. This week, I upgraded the hard disk that shipped in a mid-2010 13″ MacBook Pro (MacBookPro7,1) to a larger capacity disk which necessitated clean installs of OS X and Windows. But the Windows 7 installer (quietly) hung at the last step in the installation process. “Completing installation…”, indeed. Looking on-line, I came across posts from several other other people who were having the same problem, but just the one, improbable-looking, solution. Improbable as it may have appeared, after following each step, exactly as described, Windows 7 Professional (32-bit edition) installed without complaint.. The scores for graphics are higher than under Windows 7 RC – lifting the overall score – but the experience is not much changed: it’s still snappy and responsive. Drivers are provided, out-of-the-box, for for all of the XT’s hardware bar the multi-touch screen. The touch screen’s manufacturer, N-trig, have made Windows 7-specific drivers available; although the as-of-writing link on the page refers to the “Windows 7 Release Candidate”, the download itself seems to contain up-to-date drivers for Windows 7 RTM. To enable automatic re-orientation of the XT’s display when switching between notebook- and slate-modes, install the Dell QuickSet application (the XT does not have an accelerometer like, say, the iPhone). Dell do not appear to be providing Windows 7-specific drivers (and other software) for the XT, but the Windows Vista version of QuickSet seems fully compatible with 7. UPDATE: The KingSpec SSD featured in this post died after 10 months. UPDATE 2: A second KingSpec SSD lasted just a further four weeks before it, too, expired. 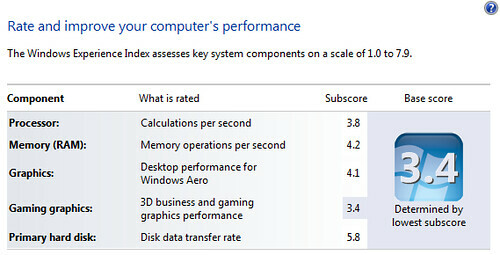 That is, a 5.8 for a 128 GB KingSpec SSD under 64-bit Windows 7 Release Candidate. Apart from the “Disk data transfer rate”, some of the scores for other components are lower than under Windows Vista, possibly because the scale has changed, at the top end, from 5.9 to 7.9. To use, the SSD-equipped XT is snappy and responsive, though only slightly more so than when fitted with a 5400 RPM HDD (and the cache had been warmed up). The more substantial difference is that the machine is available for use almost immediately after log in; no need to wait for SuperFetch to fill its cache(s), which seemed to take as long as ten minutes. Beyond the SSD, Windows 7 seems a good fit for the XT: drivers are provided, out-of-the-box, for every component bar the touch screen, drivers for which are otherwise available here. Once installed, the touch experience is much smoother than under Vista, up to and including inertial scrolling, which exhibits a pleasant bounce effect at the top or bottom of a page in Internet Explorer.